Only returning now to FE after a break. So this might have been posted already ... but I don't think so. It's insightful I think from my favourite Italian Vatican watcher Sandro Magister. There are three candidates as pope who are being whispered about at the Vatican and beyond. One Asian, one African, and one European, and an Italian at that. And the third is the only one with the slightest chance of being elected at a hypothetical future conclave. The Asian is Manila archbishop Luis Antonio Gokim Tagle, a Filipino who has a Chinese mother and studied in the United States. For the supporters of Pope Francis, he is the ideal candidate for carrying on his legacy. In 2015, Jorge Mario Bergoglio appointed him as president of Caritas Internationalis, after having made him the head of the synod of bishops on the family. And in April of 2016, right after the release of the exhortation “Amoris Laetitiia” in which the pope opened up communion to the divorced and remarried, Tagle was the first of all the bishops in the world to give it the broadest interpretation. [On the Church’s course in the present time, however, his ideas are perfectly clear: with Vatican Council II the Church broke with the past and marked a new beginning. This is the historiographical thesis of the “school of Bologna,” founded by Giuseppe Dossetti and today led by Alberto Melloni, to which Tagle belongs. He is the author of one of the key chapters in the most widely read history of the Council in the world, the chapter on the “black week” of the autumn of 1964. At polar opposites from the interpretation of the Council given by Benedict XVI, who, magnanimously, made Tagle a cardinal]. That he could also be elected pope, however, is to be ruled out. Too similar to Begoglio not to end up beaten down by the many reactions to the current pontificate that will inevitably come to the surface in a future conclave. And then there is the obstacle of age. Tagle is 60, and could therefore reign for a long time, too long to bet on him. The African is Cardinal Robert Sarah, 72, from Guinea. An indomitable witness of the faith under the bloody Marxist regime of Sekou Touré, he escaped execution only because of the tyrant’s sudden death in 1984. He grew up on the savanna but pursued advanced studies in France and Jerusalem, was made bishop at the age of only 33 by Paul VI, and was called to Rome by John Paul II and kept there by Benedict XVI, with whom he was and still is in full accord. Sarah was revealed to the world by two books of his that were translated into various languages: “God or Nothing” in 2015 and “The Power of Silence” this year. There is an abyss between his vision of the Church’s mission and that of the Jesuit pope, both in content and in style. For Sarah, as for Joseph Ratzinger, the absolute priority is to bring God to the heart of civilizations, especially where his presence is obfuscated. For the opponents of Pope Francis in the name of the grand tradition of the Church, he is therefore the ideal candidate. But in a college of cardinals almost half of whose members were appointed by Bergoglio, it is unthinkable that he would obtain the two thirds of votes necessary for election. The fact remains that Sarah’s is in the history of the Church the first true candidacy, albeit only symbolic, of a pope from black Africa. Not symbolic but very realistic is instead the third candidacy, that of Pietro Parolin, the cardinal secretary of state. One must go back to the conclave of 1963 to find elected as pope, with Paul VI, a churchman who came up through the heart of the Vatican curia and was recognized for his managerial skills, after a pontificate like that of John XXIII, who had set into motion a council that was at the height of tumult but had not yet produced a single document. Paul VI succeeded in the enterprise, although he undeservedly ended up in the black book of those accused of betraying the revolutions. 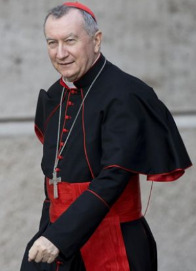 Today the enterprise that a growing number of cardinals would entrust to Parolin is that of piloting the ship of the Church in the storm unleashed by Pope Francis, correcting his lurches without betraying his spirit. As secretary of state he has demonstrated that he has these qualities, even on the most intricate portfolios like that of China or of Venezuela, where he knows how to hold back the impatient or placatory tendencies of a Bergoglio who loves to do it himself. Moreover, there is in Parolin a profile as pastor, with a solid theological formation, that is rarely found in a prestigious diplomat. His recent trip to Moscow was a crystal clear example of this, where discussions at the highest political level alternated with religious meetings with the heads of the Russian Orthodox Church, just as is done on a well-structured pontifical journey. But that this is a glimpse of the future is purely hypothetical, as long as Francis reigns. Parolin maybe. Tagle, no way. Have we really been so bad as to deserve such a chastisement? Probably. I really hope some really holy person is able to stave off such a horrible event. (11-04-2017, 05:31 PM)Credidi Propter Wrote: [ -> ] Parolin maybe. Tagle, no way. Would be interesting to see what Liberal Progressives would do with a Black pope, who is anti progressive on social issues..
Americans, at least, would demonise him as an 'Uncle Tom', and an 'Oreo' (black on the outside, white on the inside), just as they have Mr Justice Thomas and Dr Carson.